1999 was the first year the Highlander was introduced by Toyota. 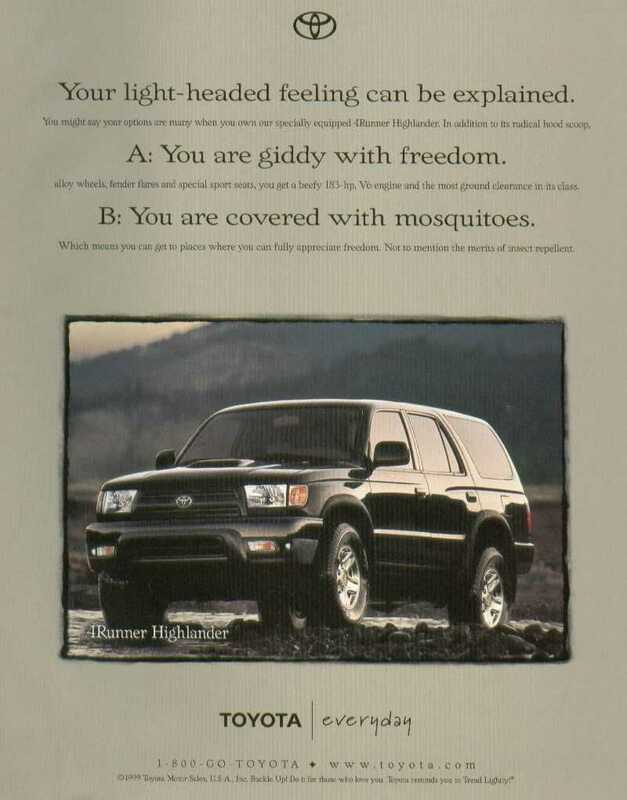 A 1999 Highlander is a Toyota 4Runner SR5 with the SP or SX Option Package. In 1999 it's exterior was available only in Black or Imperial Jade Mica. The Mica Jade came with an Oak interior, and the Black version came with either an Oak or Grey interior. 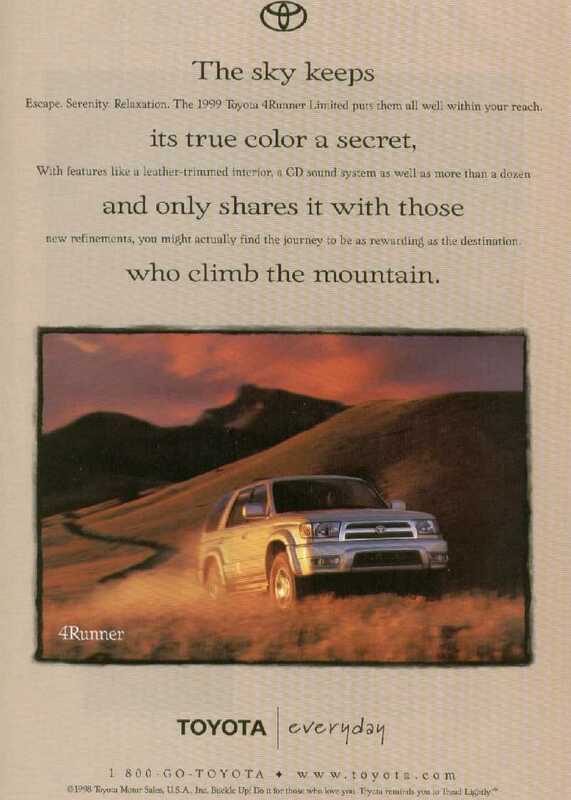 In 2000 the 4Runner Highlander was additionaly offered in Millenium Silver. See the table below for a complete listing of features in the Highlander Package. The table shows which of these features are or are not available individually on the SR5 or Limited 4Runners. Black Fender Flares Option Code: FN Color-Coordinated Flares and Bumpers are Standard. Color-Keyed are Avail. on the Mica Jade with Option Code: CB. Toyota does not display the Highlander name on the exterior or interior of the 1999-2000 vehicle. In fact it is not even mentioned in the consumer brochure/catalog, although the name is imprinted on the window sticker. This is the only Highlander Advertisement I have seen. Volume One, Number One, Spring 1999. The Ad is printed on the inside of the back cover. I saw in National Geographic. 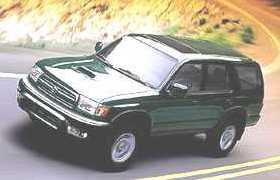 The 1999-2000 4Runner Highlander, and all 4Runners for that matter, are Truck based SUV's. 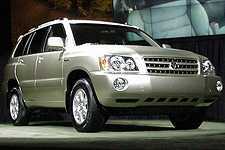 Beginning in 2001 Toyota has introduced a new mid-size car-based SUV called Toyota Highlander. Therefore they no longer call the 4Runner with the sport package (SP only for 2001+) a Highlander. "For buyers seeking the real-deal in traditional mid-size performance, with a bias toward multi-use, we have 4Runner Highlander. For buyers demanding the image and versatility of an SUV, but who prioritize car-like ride and handling, we have Highlander." 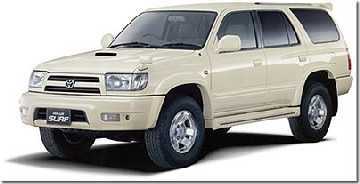 The Japanese Version of the 4Runner is called the Hilux Surf. It has had the Hood Scoop for a few years prior to 1999. In that particular application the Hood Scoop is functional and feeds air to a Turbo Deisel engine. The Highlander Scoop is non-functional. 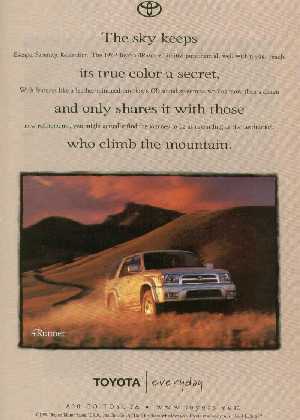 To view the 1999 Base Model, SR5 and Limited's paint options, see this paint chip color chart.